Hello guys! You now when sometimes you want a quick and easy sewing project to give you that feeling of instant gratification? That feeling of accomplishment, something that you can sew in one night and wear to work the next morning? Well, I'm here to share a project exactly like that! This is the newly released Onyx shirt pattern from Paprika patterns. I was a reviewer for this project, which basically meant that Lisa sent me this pattern to sew in exchange of a blog post in which I could write whatever I wanted, good or bad. Seems like a very fair deal to me! This is my first time using Paprika patterns. Their Jasper sweater has been in my to sew list for a long time now and I should really make it happen soon. The Onyx is a shirt pattern for woven fabrics with two views. View A is a shirt length with a high neckline and short sleeves with cuffs and View B is a cropped top with a scoop neckline and small waist darts for shaping. You can mix and match the two views with endless possibilities! I choose to sew View B in a size 4 without any alterations. I used a polka dot woven fabric I had in my stash and some white single fold bias tape to finish the neckline and the armholes. I love this top! 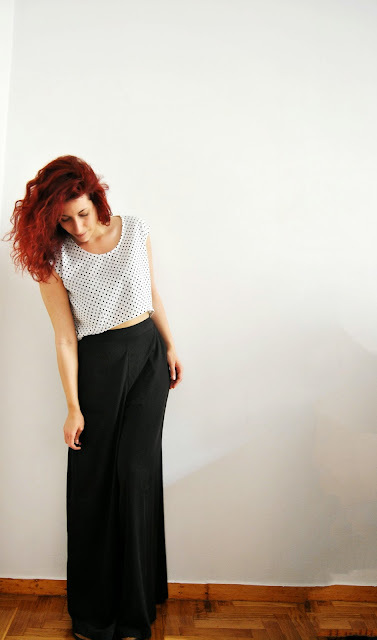 It's the perfect summer crop top to pair with high-waisted trousers and skirts! The instructions were very clear and easy to follow and the top came together in less than two hours! I plan on making many more of these tops for summer! The pattern is on sale for 15% off until this Sunday at 12:00am Central European Time, so if you like Onyx, you better hurry to grab your copy! *Disclaimer: Lisa sent me this pattern in exchange for an honest review. All thoughts and opinions are 100% my own. Cute! I've been waiting to see a cropped version! This is majorly cute on you!!! This is not a skirt. They are RTW palazzo pants.